President Bashar el-Assad’s regime has on average wrecked or destroyed one Syrian Sunni mosque every 13-to-14 hours since the beginning of the uprising against his rule. 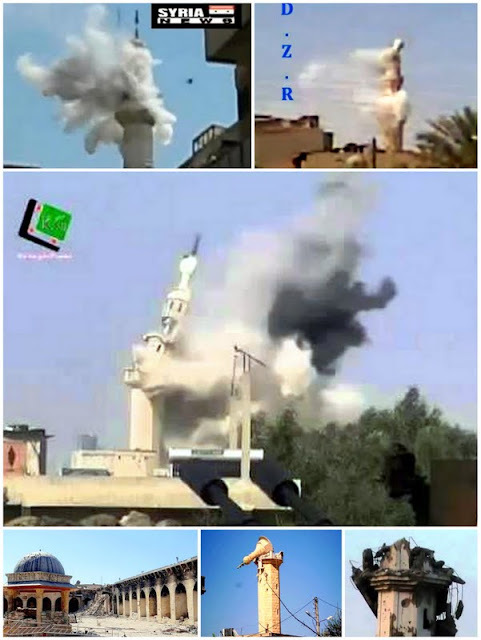 His forces attacked at least 1,451 mosques in the period from March 15, 2011 to June 6, 2013, by the count of one watchdog, the London-based Syrian Network for Human Rights (SNHR). Of those, 348 were destroyed completely, the group said. 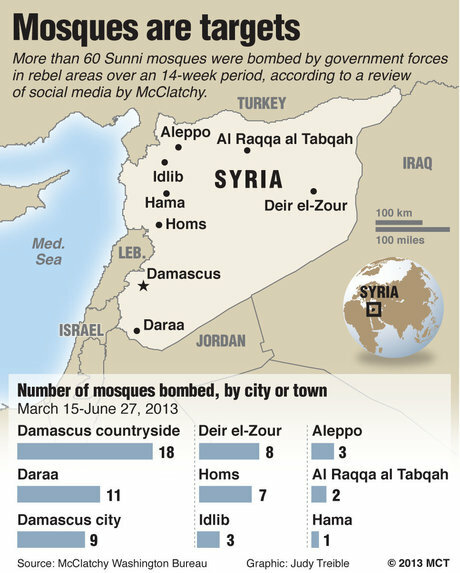 On average, that’s one Sunni mosque less every 2.3 days. SNHR has videos documenting its figures and says most of the damaged or destroyed mosques are in Rif Dimashq (308), Idlib (237), Homs (217), Aleppo (158), Homs (135) and Damascus (92). The Syrian Network for Human Rights also accuses the government of targeting Sunni clerics, saying 48 imams have been killed, including 15 who died in regime custody. The pattern seems evident in Syrians’ postings on social media – YouTube, Twitter and Facebook. In a 14-week period, from March 15 to June 27 this year, the Washington Bureau of McClatchy -- America’s third largest newspaper company -- found contemporaneous videos showing 62 mosques attacked, on average one every two days. At least eight of the mosques had been targeted more than once. The 62 mosques were in Rif Dimashq (18), Deraa (11), Damascus (9), Deir Ezzor (8), Homs (7), Idlib (3) Aleppo (3), Raqqa (2) and Hama (1). A prominent Syrian archaeologist said he judged the group’s figures of damage and destruction “close to reality.” The vast majority of these mosques “were damaged due to regime bombing,” said Dr. Cheikhmous Ali, the head of the Association for the Protection of Syrian Archaeology, who’s based in Strasbourg, France, and has advised the U.N. High Commission for Human Rights. The U.N. High Commission for Human Rights expressed astonishment at the dimensions of the reported attacks. The Grand Mosque in Douma, one of the largest in the Damascus suburbs (see before and after pictures here).